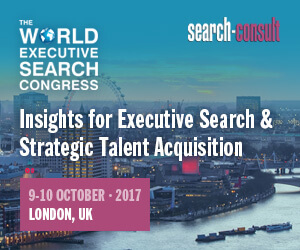 search-consult is pleased to announce that the 2017 World Executive Search Congress (#WESC2017) will take place on October 9-10 at BMA House in London, UK. Each year, the World Executive Search Congress aspires to deliver on three main premises: to provide industry insights, to inspire new ideas and to create unparalleled international networking opportunities that turn into lasting new business relationships. Excellent feedback from past attendees describing the event as “a superior learning opportunity”, “impressive”, “thought-provoking” to name just a few, encourages and challenges us to create ever more impressive content to deliver on these principles. This year our challenge is even greater. Encouraging news about growth in Executive Search activity so far this year are overshadowed by the impending new data privacy legislation (GDPR) that will dramatically change how Executive Search firms – and corporate recruiters – store business-critical information. There will be a special session addressing the new rules and the specific implications for the Executive Search industry, followed by a panel discussion that will dive deeper into the topic. – Simon Mullins of ESIX – Executive Search Information Exchange – will share insights on what clients are really looking for. – Two representatives of WH Ireland Plc will explore funding, growing, valuating and exiting your Executive Search firm and will help you understand your strategic options. – Elizabeth Wallace from BlackRock will draw on her extensive experience to share her tips on attracting the best talent while delivering diverse leadership in order to increase profitability. – Mark Anderson, Partner at PrimeGenesis and author of The Leadership Book, will share his insights how Search firms can assist their clients in creating a successful onboarding strategy. – Charlie Atkinson, Chief Executive of Human Factors International, will walk the attendees through the real predictors of executive performance (hint: industry experience plays little part) and the use of assessment techniques for matching non-traditional executive candidates with job roles and organisational fit. – Masterclasses in LinkedIn Research and Client Management will enable you to source the best talent to help you remain competitive and add value to your clients. As in previous years, the event will consist of a mixture of plenary and concurrent sessions, with a number of panel discussions and practical training sessions to choose from. Ample international networking opportunities, including a drinks reception at the end of on day 1, will create many chances for informal discussions and for delegates to get to know one another in the fabulous surroundings of BMA House. Limited tickets are still available, so we encourage you to book now to avoid the disappointment. Special pricing is available for Dillistone Systems clients. The 2016 event’s testimonials video can be viewed HERE.